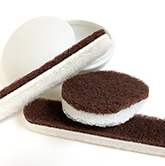 Abrasive Cleaning Files are ideal for cleaning and smoothing green ware and other similar materials. Flexible files are suitable for other hobbies and crafts, too. Long-Lasting Files are also Flexible. with 120 & 200 grit.